The Jack & Jill Children’s Foundation supported by Bank of Ireland have launched the Up the Hill for Jack & Jill fundraiser 2017 this week. The charity fundraiser in aid of the Jack & Jill Children’s Foundation is asking people throughout Ireland to climb a hill to raise money for this worthy cause. 13 events are taking place nationwide on Saturday 7th of October and people can register for €16 on www.jackandjill.ie/upthehill or can create their own “Up The Hill” event to raise much needed funds. It costs €16 to register for this event which funds 1 hour of home nursing care for a sick child locally. Bank of Ireland is supporting this Up the Hill for Jack & Jill initiative by adding €4 per registration with a value of €16 or more, for the first 12,000 registrations. Jack & Jill is hoping to raise over €100,000 through this annual fundraiser and to raise awareness of its unique home nursing care and respite service which operates 365 days a year with no means test or waiting list for the families of children, from birth to 4 years of age, with severe developmental delay as a result of brain damage. Jack & Jill also provide an end of life support service to all children requiring it in this age category across the country. Speaking at the launch in Phoenix Park, GAA legend and Jack & Jill board member John O’Leary said: “Our son Tom has been supported by the Jack & Jill Charity for a number of years and the work they do and care they provide is second to none. Fundraisers such as this are crucial to the ongoing success of the charity and we would like to encourage as many people as possible to get involved”. 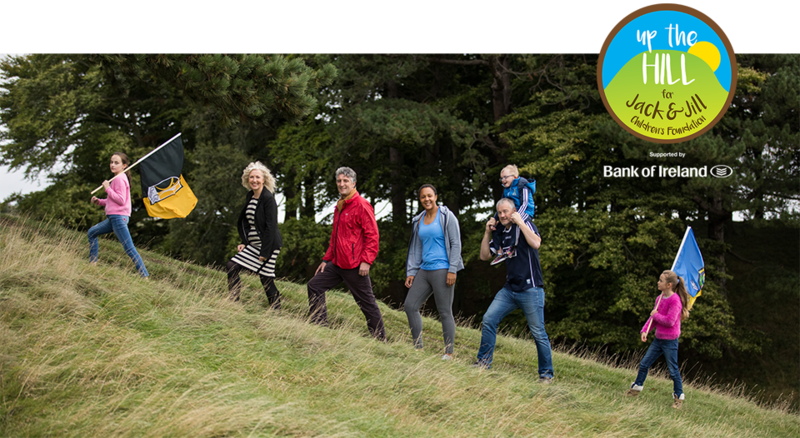 There are two pathways to take and people can either register now to climb one of 13 nominated hills on Saturday 7th October at 11am (in counties Cork, Donegal, Clare, Dublin, Galway, Kildare, Kilkenny, Laois, Tipperary, Waterford, Westmeath, Wicklow and Wexford) or register to design their own Up the Hill event locally in the first week of October. Audrey Nolan Head of CSR at Bank of Ireland said, “As one of our flagship charity partners we are delighted to be involved with this year’s Up the Hill for Jack & Jill fundraising initiative. The charity does such fantastic work in supporting children and families throughout the country and we are encouraging everyone to get out there and climb a hill to help raise some much- needed funds”.